"Our efforts to reduce violent crime are producing clear results," Pugh said. "Crime is declining in every category." Pugh told The Baltimore Sun that some high-risk neighborhoods under the Violence Reduction Initiative had seen reductions in crime. Such areas receive much-needed resources, ranging from new street lights to low wage jobs. "We are not satisfied and are determined to reduce crime and violence much more," Pugh said. "One murder in Baltimore is one murder too many. But I am convinced that by addressing the root causes that give rise to hopelessness and eventually to criminal activity, we will make Baltimore safer for all residents." On the FBI's list, Detroit had the highest overall violent crime rate for 2017, and ranked number two in homicides, with 40 per 100,000 people. Memphis, Tenn., followed (28 homicides per 100,000), then Chicago (24 per 100,000), Philadelphia (20 per 100,000) and Milwaukee (20 per 100,000). With nine months of the year in the bag, there were 216 homicides in Baltimore, which is down 16 percent compared to last year. Republican Gov. Larry Hogan said the FBI report was "shocking and disappointing, but it doesn’t come as a complete surprise." Violence in Baltimore is "something we’ve been focused on from day one," Hogan said. "We just passed some tough, new crime laws that are going to take effect Oct. 1, tougher sentences for people who commit gun crimes, tougher sentences on repeat violent offenses. I’ve been criticizing judges for lenient sentences and letting repeat violent offenders out," he said. Despite a slight reduction in this year's homicides, the governor called crime in Baltimore a "problem that's not going away." "The city’s got to invest more," Hogan said. "The mayor’s got to be more focused. We’re going to continue to back them up as much as we possibly can." City Councilman Brandon Scott, said city officials should compare this year's crime decline to post 2015 riots (<300 people killed per anum). Scott, who chairs the Council’s Public Safety Committee, said the current levels of violent crime cannot be accepted. "The new normal should be the opposite," he said. "The new normal should be us beating those record levels we saw a few years ago." A significant contributor to the chaos in Baltimore is the racial wealth divide. 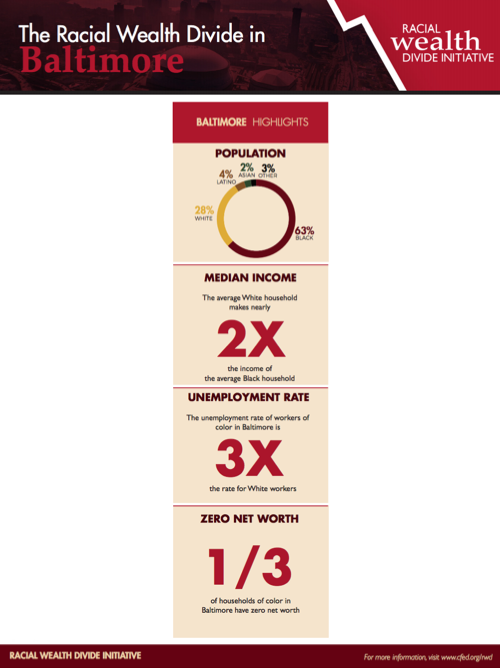 JPM profiled Baltimore in a 2017 report that specified wealth inequality has a multitude of ramifications for communities and families. Racial economic inequality in Baltimore is very similar to the nation. 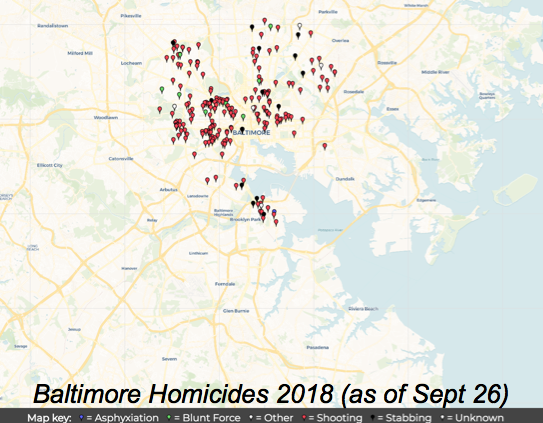 As for the homicides in Baltimore, well, the upcycle is not going away anytime soon, and it is likely to spread or amplify in other American cities, as long as the government and the Federal Reserve continue pushing flawed Keynesian policies that have produced the widest wealth inequalities in modern history. 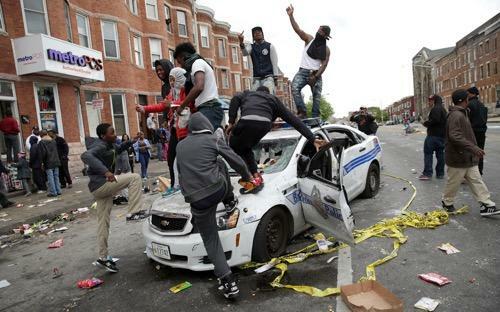 To sum up, the system is broken and chaos in Baltimore is the end result.